Want things to change, but don’t know where to start? You don’t need to do much to help improve your city. Here are 28 great initiatives to be getting on with. Every Tuesday an east London archway is filled with the smell of freshly baked bread that has been kneaded by refugee women. Support E5 Bakehouse’s Just Bread scheme by sampling its sourdough. Finally, a guilt-free way to load up on carbs! In return for rustling up tasty meals at pop-up supperclubs, Fat Macy’s offers young people living in temporary accommodation work experience and catering skills. It also, crucially, pays money into a kitty that goes towards rental deposits for flats. Tired of getting into Twitter arguments? Learn how to channel your anger at the world’s injustices through a needle and thread with these nifty mini banner kits from Craftivist Collective. Start mastering the art of gentle protest by stitching your own mini banner. The friendly team at Open Barbers cater for all, regardless of gender, sexual preference or hair length. The cost is pay-what-you-can (ideally £10-£40) and your cash ensures they continue to offer affordable cuts (£2-£10) five times a week to those experiencing financial struggles. Smart Works coaches women in interview technique and dressing to impress. The latter is where you can help. The charity particularly needs plus-size workwear, slim-leg trousers, shoes and handbags, so get rifling through your wardrobe and help disadvantaged women into work. Need a new bike? Funds from your purchase will help sustain this project, so it can continue offering refugee women cycle training and run community bicycle-repair workshops, where they fix up frames to donate to refugees. Ditch the treadmill and pound the pavement for a good cause instead. GoodGym’s running missions range from doing odd jobs and keeping an older person company to cleaning up communal spaces. Type your postcode into the website to find your nearest GoodGym community. Toast Ale is on a mission: to save unwanted loaf ends from UK bins by turning them into something we can all enjoy – beer! Profits go to Feedback, a charity fighting food waste on a global scale. We’ll drink to that. Spend time you’d otherwise waste on Netflix volunteering at North London Cares, a charity that runs a Love Your Neighbour scheme, connecting young professionals with elderly neighbours who might need help or just a chat over a cuppa. (There’s also one for south London). Wondering how to make ethical food choices and satisfy that sweet tooth? Order a treat box from DayOld, which collects scrummy surplus goods from bakeries and redistributes them at office meetings and events – with profits donated to child hunger charities. The street-savvy guides who lead Unseen Tours share their personal experiences of homelessness on these fascinating walks. Sixty percent of the ticket price goes directly to your guide and you’ll come away with new insights into an area you may have thought you knew well. London’s trees remove 2,241 tonnes of air pollution a year. So, it makes sense to plant more. With your help, Trees for Cities plans to plant 1 million urban trees by 2020. Sign up to the mailing list for future digging opportunities. Active360 runs regular river clean-ups through its Paddle & Pick scheme, which aims to raise awareness of plastic pollution through paddleboarding. It’s a fun way to exercise while doing your bit for the environment (if you can keep your balance). Every year 3,000 tonnes of clothing are resold in Traid charity shops instead of going to landfill. Donate your cast-offs, attend an upcycling workshop or buy from one of the 11 London branches funding eco-friendly fashion initiatives around the world. In these testing times, it’s more important than ever to defend freedom of speech (even if your sanity crumbles a little bit more with every @POTUS tweet). Attend a literary event and support English Pen, based in Farringdon’s Free Word Centre, which campaigns on behalf of imprisoned writers. Make the cosy Café from Crisis on Commercial Street your new lunch spot and you’ll be supporting the charity’s work helping ex-offenders and homeless people back into employment via its café training scheme. Sandwiches, salads and soups are freshly prepared, locally sourced and super-delicious. If Alanis Morissette was writing ‘Ironic’ in 2017, she’d include a line about smashing your phone screen. Brilliant Islington-based company Cracked It trains vulnerable young people to repair them. So they’re the noble choice next time you drop your mobile on a night out. Located just off Brick Lane, The Canvas Café is a not-for-profit venue that aims to improve the community’s ‘emotional health and wellbeing through creative events’. Naturally its food and drinks are free-range and ethically sourced, and even sceptics will be won over by the vegan freakshakes. Hackney Wick’s Hub 67 community centre is helping Londoners stay warm this winter by operating a ‘compassionate coat rack’ where anyone can pick up a free parka, jacket or mac. Add your old coat to the rack on weekdays between 8.30am and 6.30pm. Hackney-based start-up Rejuce makes nutritious blends of fruit and veg that are still fresh but not ‘pretty’ enough for the shops. Bruised bananas and wonky cucumbers taste the same as pristine produce once liquidised, so try Rejuce when you need a vitamin hit at a festival. Since launching in 2014, the campaign to make London the world’s first National Park City has gained momentum, with support from Mayor Sadiq Khan, among others. Nearly 40 percent of the capital is green space; let’s make sure we protect it for future generations. Supply Yoga’s regular classes in Clapton and Homerton use your £5-£10 donation to fund therapeutic yoga experiences for people who wouldn’t normally have access to them. MahaDevi in Holloway operates a similar system, hosting adult classes that help fund yoga therapy sessions for children with special needs. Having fought since 2014 to save London’s oldest LGBT pub-performance space, the Royal Vauxhall Tavern, from property developers, the RVT Future Committee is now launching a community buyout. Dig deep and help protect a key piece of the capital’s queer history for good. We know he’s a hottie but put down that Benedict Cumberbatch colouring book and swap it for a right-on Sisters Uncut one. There are fewer glorious curls, but when you buy it your money will help the feminist direct-action collective in their campaign for better services for victims of domestic violence. Tackle transphobia with your talons by wearing specially designed heart decals by London activist Charlie Craggs, the woman behind Nail Transphobia. Charlie travels around the UK with a pop-up salon giving free manicures and the opportunity for people who have perhaps never met someone who’s trans to have their misconceptions debunked. Nailed it. Punk4MentalHealth aims to raise money to fund mental health research at Roehampton Uni by ‘The Punk Professor’ Dr Joel Vos. At this five-day event in March there will be a smorgasbord of activities – from live music and a punk art installation to mental health talks. East London charity Cabaret vs Cancer raises money through cabaret and burlesque to help people living with the disease. Their annual Ashes to Ashes II event includes an online auction of Bowie-inspired art and a night of cabaret devoted to the starman. In Time Out’s City Index research last year we found that London was the loneliest city of all the ones we surveyed. Today the Jo Cox Commission on Loneliness has launched a campaign to tackle the problem. Look out for badges being handed out at tube stations that say ‘Happy to chat’, pin one on and get gabbing! You might just make someone’s day. 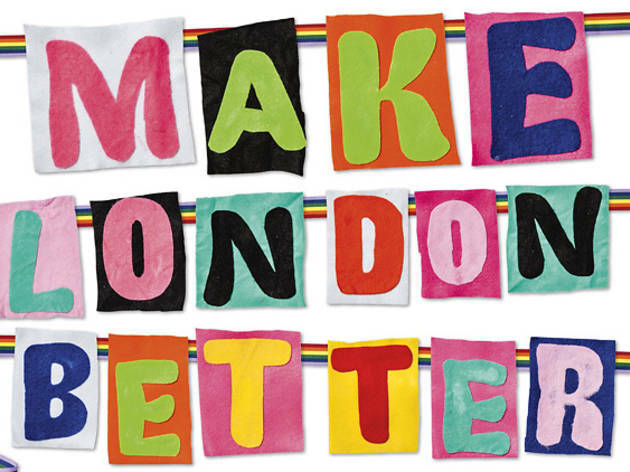 Want other ways to make London better? Grab a 'Happy to Chat' badge as part of an initiative to combat loneliness. Some great words from some great writers.